Coombe Hawne is a small cove on the South Cornwall coast about a mile west of Fowey on the coast path. There is a small shingle and sand beach with some rocks at low tide. A short distance west on the coast path there is a small narrow cove with a small area of sand called Little Coombe Hawne. No warning signs. See Beach Safety Guide. 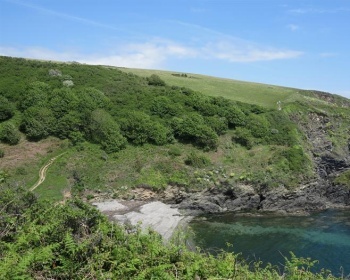 Access is via the coast path, the nearest car park is at Readymoney Beach on the outskirts of Fowey. It takes about 30 minutes to walk from the Readymoney Car Park to Coombe Hawne. Final access to the beach at Coombe Hawne is via a rough sloping path to the beach. Fowey is 9 miles from St Austell and 19 miles from Liskeard. Approach from east or west on the A390. 2 miles west of Lostwithiel turn onto the B3269 (signposted to Fowey). Continue on this road until a roundabout and here go straight across (onto the A3082 again signposted to Fowey) and turn left at the next two roundabouts. Instead of driving down into Fowey follow the road (which becomes Hanson Drive) above the town to park above Readymoney Beach. Then take a path down to Readymoney Beach and follow the coast path west. No parking, park at Readymoney Beach. No toilets, there are toilets at Readymoney Beach and in Fowey. Shops, cafés, restaurants in Fowey.